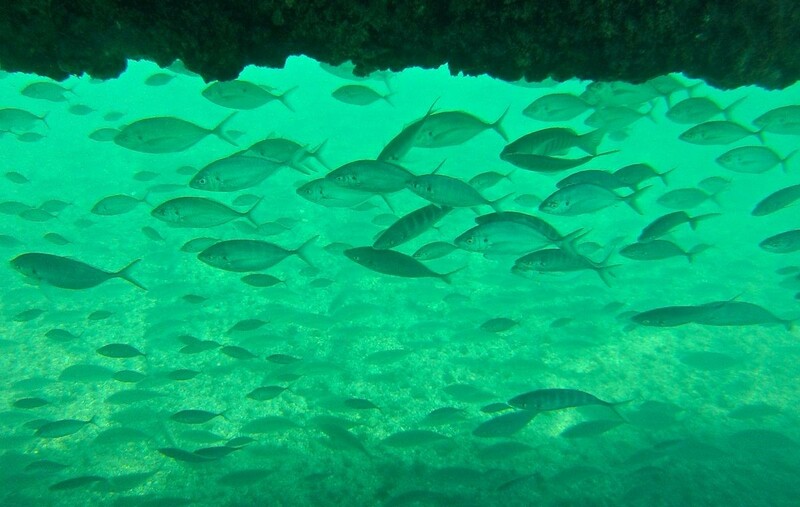 Hiding in the shade of the Omaha jetty floating pontoon this afternoon were hundreds of trevally of all sizes. They were accompanied by smaller numbers of parore and mullet, all station-keeping under the pontoon in the outgoing current. The water was beautifully clear about two hours after high tide, as there had been no rain and little wind for several days, the water offshore is really clear at present, and the vast numbers of cockles in the harbour would have finally “polished” the water of any remaining plankton and sediment. I have seen trevally like this under the pontoon before, but they have usually stayed only a couple of days before moving on. But when they are there they are a lovely sight. Today I just held my Go Pro camera in the water over the side of the pontoon, but it would be great to snorkel quietly over to the pontoon and take a closer look.